Born in Sacramento, California, Daniel Bell grew up outside of Toronto, Canada, and then moved to Detroit where he collaborated with Richie Hawtin as Cybersonik for three years on Plus 8 Records. 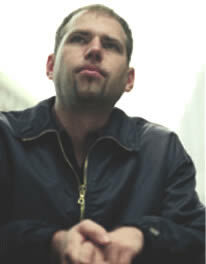 In 1991, he started his own label, Accelerate, on which he released his influential releases as DBX. Based on nearby Chicago "track" records, he reduced that sound further into funky, streamlined grooves. The formula proved to be successful and helped launch a new aesthetic in techno and house music known as "minimal". With the overwhelming success of his "Losing Control" single in 1994, Daniel set up 7th City Distribution in order to assist smaller Midwest labels to get distribution in overseas markets. He also created three new labels - 7th City, Elevate and Harmonie Park. In 2000, he relocated to Berlin, Germany, and released his first mix CD, The Button-Down Mind of Daniel Bell, on Tresor Records. He since has produced a series of remixes for a diverse range of artists, includng John Tejada, Pantytec, Akufen and John Thomas. He currently has a DJ residency at Robert Johnson in Frankfurt.